TOP PAGE　>　Strategy　>　Growth Strategy　>　Kappa Create Co., Ltd.
Kappa Create became a part of the Colowide Group in December. 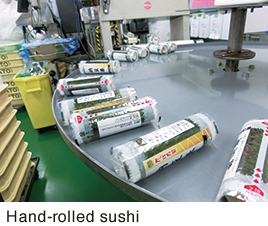 2014, and action was taken to re-brand the Kappa-sushi, the conveyer-belt style sushi business. To regain its position in the market as a leading company, Kappa Create has, as part of its new marketing plans, been implementing measures to improve its earning capacity and introduced a new logo design that includes switching the signs at all establishments to ones incorporating the new logo design. It has also been developing a new store design and feature products. Furthermore, through collaboration with Colowide MD, the company has gained a competitive edge in the procurement and quality management of tuna and other fresh fish and become capable of providing customers with even more reliable, safe and reasonably priced products. 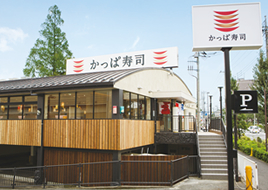 There are currently approximately 339 establishments in Japan and as the pioneer of the 100 yen conveyer-belt system sushi, it provides a pleasant and joyous time to the customers all around the country. 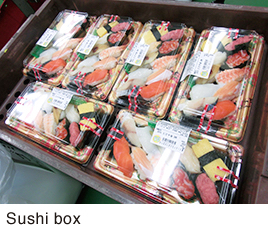 In delicatessen business, our group company Japan Fresh’s Ageo, Fuji, Nagoya, Shiga, and Amagasaki factories manufacture and wholesale hand-formed sushi, hand-rolled sushi, OEM style bento boxes, side dishes, stuffed breads, desserts etc. for major convenience stores, supermarkets in Tokai, Kansai, Hokuriku and Kanto areas. 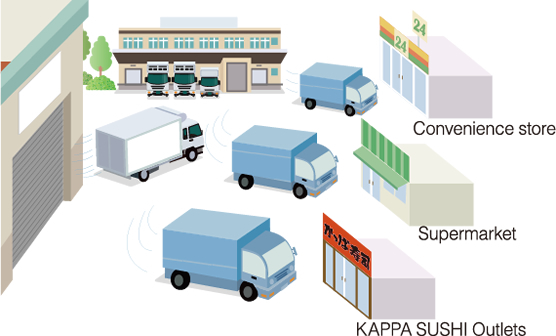 We will continuously strive to expand our sales areas for the delicatessen business, a very large market, in order to make it the second pillar of the company’s business portfolio, with Kappa-Sushi being the first. 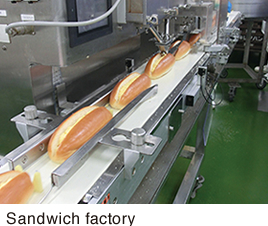 Under the ISO22000-certified management system, each factory is implementing strict hygiene control from incoming raw material shipment to outgoing product shipment, with the aim to expand sales to convenience stores and supermarkets across Japan. 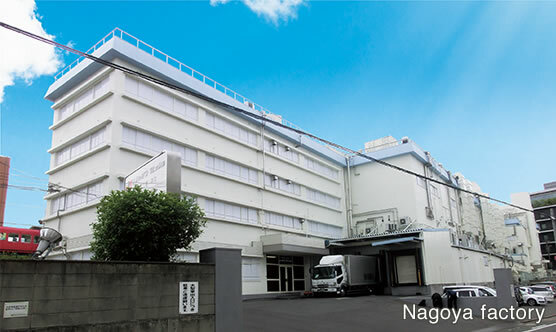 Every factory of Japan Fresh that deal in delicatessen business, is ISO22000 certified. 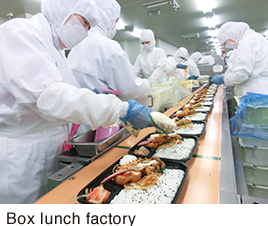 Under a strict management system, we manufacture and wholesale desserts to Kappa Zushi chain, and bento boxes, side dishes, stuffed breads, hand-formed sushi, hand-rolled sushi etc. to major convenience stores, super markets and so on. Copyright (c) COLOWIDE CO.,LTD All Rights Reserved.